There has been a lot of buzz about the MySQL 5.5 GA release and its new features and other user-visible improvements. In this blog post, I'd like to touch on a less noticeable, but still important change. CMake has already been used to build the MySQL Server on Windows for a long time, while the GNU autotools were used on all other platforms. Since MySQL 5.5, all builds on all platforms are now performed using the same tool chain. With the latest release of MySQL 5.5, we've made an important step to clean up and simplify the MySQL build system: the support for autoconf/automake has now been removed completely. We've been performing the release builds of MySQL 5.5 using CMake exclusively for quite some time already. It became obvious that maintaining two separate build systems simply had become too much of a burden for our engineers, especially since the autotools-based builds were no longer exhaustively tested. This change was outlined in WorkLog#5665 - Removal of the autotools-based build system. We've made this step in close cooperation with our community of packagers (e.g. the maintainers of MySQL packages on the various Linux distributions). By moving to CMake, we are giving our developers one common build mechanism for all platforms and there is a lot of new useful functionality such as out-of-source builds or a GUI for configuring the build options. And they can now build MySQL in the very same way that we do it for our own binaries! I've covered the advantages in my previous blog post about Building MySQL Server with CMake on Linux/Unix already. We've also created a general article about CMake and MySQL as well as an Autotools to CMake Transition Guide on the MySQL Forge Wiki. The description of the source build process in the reference manual has also been updated to reflect this change. A big “thank you” should to go to Vladislav Vaintroub and Davi Arnaut for implementing and pushing the transition to CMake forward, and to Paul DuBois for creating and improving the documentation! Wearing my former build and release engineer hat, I am very happy about this change. As part of the upcoming Oracle OpenWorld/Java One in São Paulo, Brazil next week (which will also include MySQL-related sessions), there will be a free MySQL Community event, which will take place on December 8th, from 13:00-18:00. Oracle invites you to attend the MySQL Community Forum! Don't miss an evening filled with technical sessions led by engineers and leaders of the MySQL open source community. You will have the opportunity to learn more about MySQL, Glassfish and what innovations to expect from MySQL 5.5. This free forum is open for members of the MySQL and Open Source community interested in knowing how small and large companies use MySQL and how they take advantage of our solutions. Choose from five highly technical sessions with well-known speakers, covering topics such as: MySQL Cluster, High Availability, Replication Tools, MySQL and GlassFish. See how Ricardo Eletro.com are using MySQL to achieve high levels of performance. Meet old friends and share your technical questions with the engineers of MySQL and Open Source community leaders. See how the GlassFish, NetBeans and MySQL work in perfect harmony. See what's new in the world of MySQL. Sounds like a fun event to be at — if you're a MySQL user/enthusiast and you happen to be in the area, don't miss this! You can register for the event via phone or email to the contact information given on the page cited above. Hello from Birmingham, UK! I'm here to attend and speak at the UKOUG Technology & E-Business Suite 2010 conference (what a name!) We actually have two packed tracks of MySQL Sessions this Wednesday, including a keynote by Richard Mason (Vice President of MySQL Sales and Consulting at Oracle) about Oracle's strategy and plans for MySQL as well as highly technical sessions about MySQL High Availability, Scalability and Performance tuning from experts in the field. Ronald Bradford, Oracle Ace Director and long-time MySQL community advocate will also be there, speaking about Common MySQL Scalability Mistakes and MySQL idiosyncrasies that BITE. The latter talk is actually going against my own talk about "Making MySQL Administration a Breeze - A Look Into a MySQL DBA's Toolchest". This is going to be interesting! If you happen to be nearby, don't hesitate to come over! 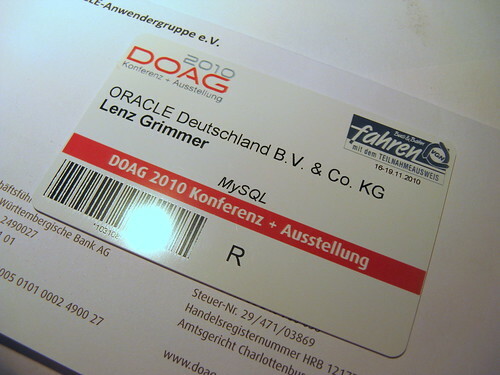 Admission to the MySQL session stream and the exhibition area is free! The online registration has been closed in the meanwhile, but I just learned that you can just turn up on site and the conference team will accommodate you. See you on wednesday! Behandelt werden unter anderem MySQL-Replikation, MySQL Cluster und ein Ausblick auf MySQL 5.5. Die Teilnahme ist kostenlos, eine frühzeitige Reservierung ist daher empfohlen. Weitere Informationen gibt es auf der Veranstaltungs-Seite.